I have been extremely busy packing for Sweden and saying goodbyes to my family in Malaysia so naturally the first resolution of mine to go is the one saying that I will blog every day. Just three days into it too, aw phooey. From here on I will try my best to blog as much as possible, so every day if I can and much much more than 2013. Anyway enough digression onto the subject of this post. Most of yesterday was spent with mum in my room repacking the stuff I had already packed. My mum is the most organised person on the planet, she has been consistently nagging me every day for the past two weeks to pack for Sweden. I know, I know her enthusiasm is downright incredible. I would cave in occasionally and do the dirty deed but when I was almost completely packed on Sunday, she had a look and decided she would repack it all for me anyway because what I’d done was simply not up to her standards! I complain a tonne but I absolutely love my mum. I don’t know how families with disorganised mums even manage to function, mums are basically the backbone of any organisation. 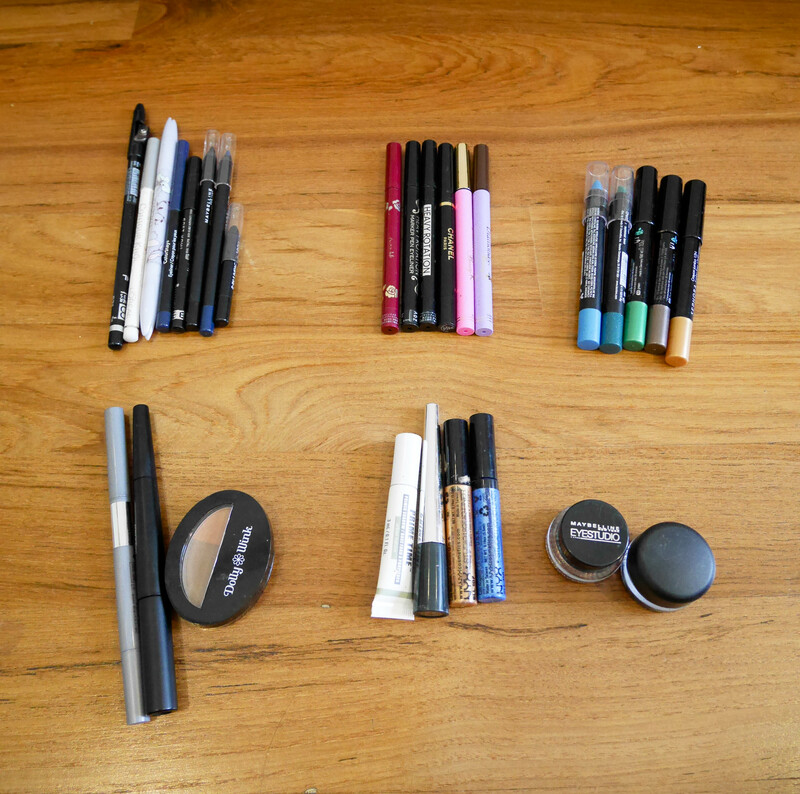 It came to the make up section of the packing and I decided it would be a really good time to do a stock take of all the make up I own* so I can remember what I already have. Pouring out all the make up was quite confronting as there were so many forgotten pencil liners or eyeshadow palettes buried at the bottom of numerous make up pouches. I decided to take advantage of this rare moment of me wanting to be organised so I sorted everything into categories, culled a lot of things (as some of this make up is very old) and took photos. Some of these have already been featured on my Dayre which is where I post little daily blog posts. My Dayre is updated a lot more often than my blog so do check it out! It was also great to get to test out my new Panasonic Lumix GM1, an early birthday/Christmas gift from my dad and stepmum, but more on that in a separate post! * I still have other bits and pieces that I may have forgotten to take pictures of but it’s probably because they are very old items or I never really used them anyway. Products are discussed from top to bottom, left to right. The Sephora Grey Shimmer Eyeshadow Palette is the name I have christened the top left palette because it is so old I haven’t been able to find its name online. I am very sure it is not in production anymore. For the same reason I don’t really use it, but when I was much younger I coveted this palette so much. That is probably how it ended up in my possession even though it really belongs to my mum who had bought it in America (Mum if you’re reading this, sorry!). From what I remember it had a lot of great glitter payoff but it was not very pigmented at all. I’m not sure if that speaks for any of Sephora’s other eyeshadows, again this was a long time ago. This Kate Green and Silver Palette I bought at Sasa on a trip to Hong Kong. At the time I really liked green and thus this subtle lime green was the the perfect way to accent my eyes. After this there was a huge gap in which I did not purchase eyeshadows anymore as my eye make up routine was 100% eyeliner and nothing else. 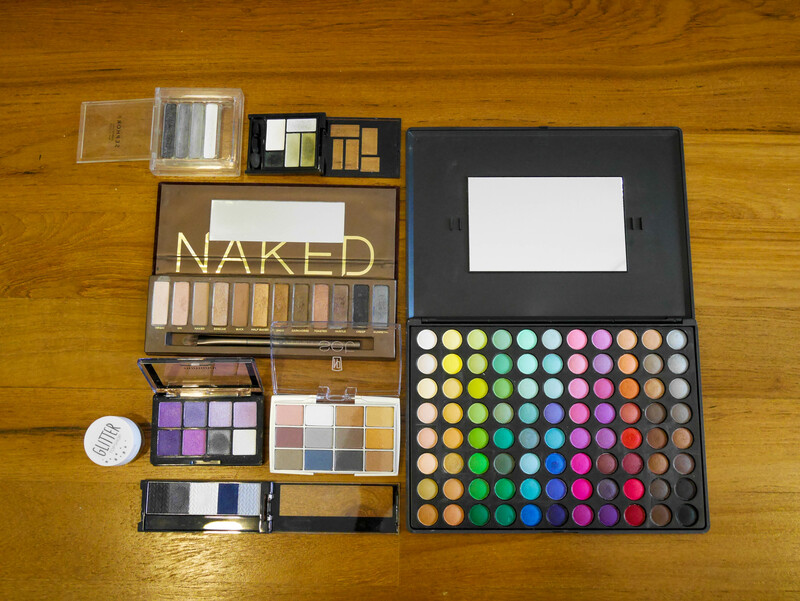 My NAKED Urban Decay Palette was my first splurge on eyeshadow. At the time the NAKED 2 had already been released but not in Malaysia. In hindsight I’m very happy I got the NAKED over the NAKED 2 because I think the colours in the NAKED are more wearable for me. 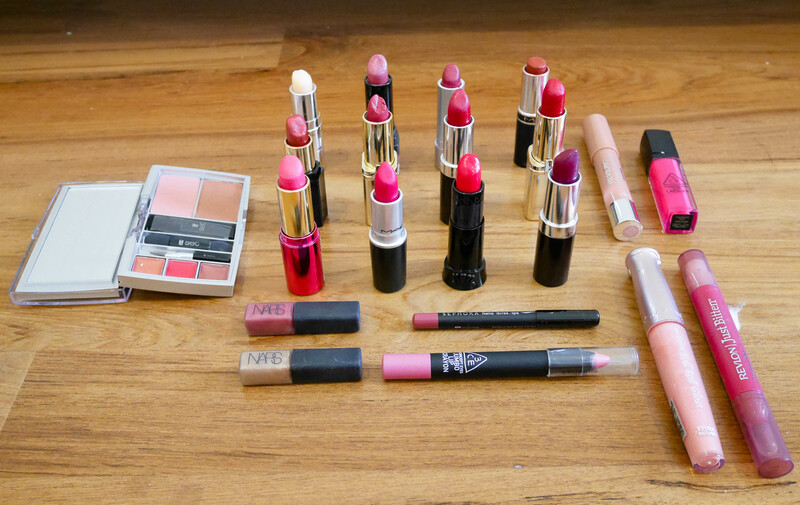 I’m excited to try the NAKED 3 though, rose coloured hues have been looking particularly delicious lately. That Topshop Glitter pot I bought most recently so I could have sparkly eyes for our Christmas eve party. It’s pretty good for Topshop make up not that I’ve ever heard anything good or bad about make up from Topshop. My Purple Eyeshadow box is some no name brand I bought at the giant Asian make up store at Paddy’s Market in Sydney so I could do MichellePhan’s Nana make up tutorial for our photoshoot a few years ago! It is horrendously under pigmented but after building like a billion layers you should see some colour pay off. This Napoleon Perdis eyeshadow was a 21st gift this year from another friend. It looks absolutely pristine because it is, I haven’t had the heart to break into it yet because it looks so clean! The Maybelline Eyeshadow palette is pretty good for a smoky eye but if you don’t have an expert and delicate hand the colours become very muddy when blended together. Something I learnt from experience. The very last giant palette on the right needs no introduction, my Coastal Scents 88 Original palette is inconsistent among the colours in terms of pigmentation but for the price I paid it is so worth it to be able to have an arsenal of colours with you all the time. I am currently using the Missha Bulgarian Rose BB Cream given to me by my friend Rachel. I’m not loving the scent but I prefer its matte finish over the shiny finish of the other one. Both provide very good coverage though! 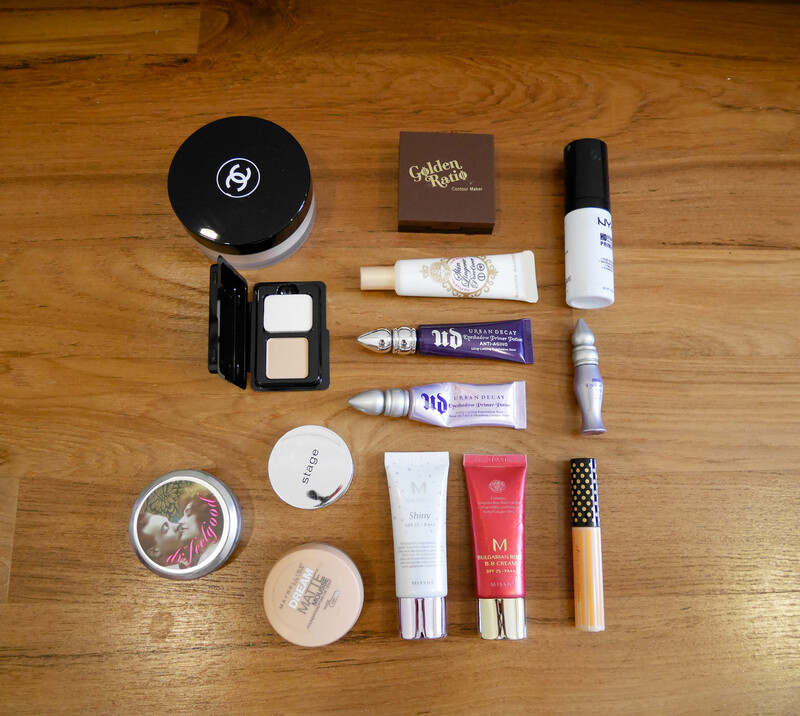 I also use the Calypso ほうれい線 。くま を隠す concealer (orange bottle on the bottom right) quite often. My pride and joy however is the Chanel Poudre Universelle Libre Natural Finish Loose Powder at the very top, this is a brand new one that my mum got for me recently after I goofed and left my original one in Australia. I only started using mascara again when I bought the new Shu Uemura lash curler. I used to hold the opinion that mascaras were useless but with this new curler I’m a convert. My most used are the Revlon Photoready 3D Volume one on the left and the Kiss Me Heroine Make on the right. 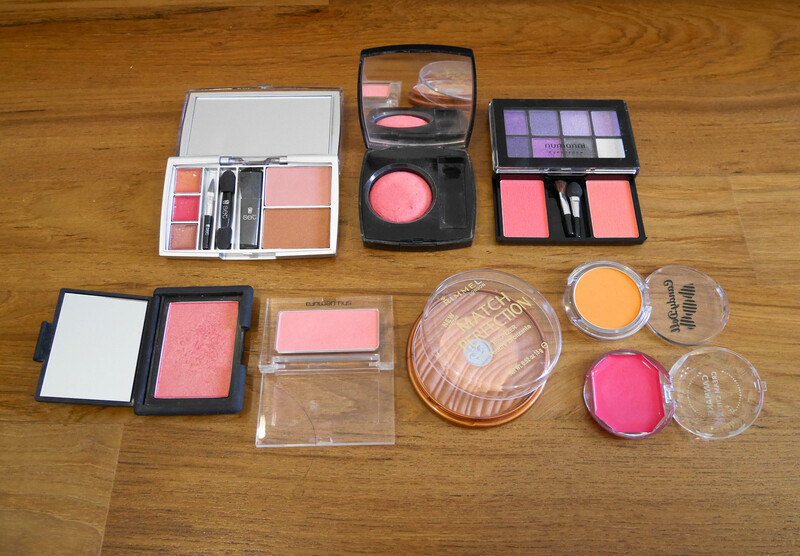 Powders and creams to use during the different seasons, I try to go very light with blush when I go out especially if its a night out drinking as I Asian flush very badly. The Shu Uemura blush (I think it is in the colour Pulse) I was given 2-3 years ago by some of my friends is the most forgiving as you can tell by the colour. 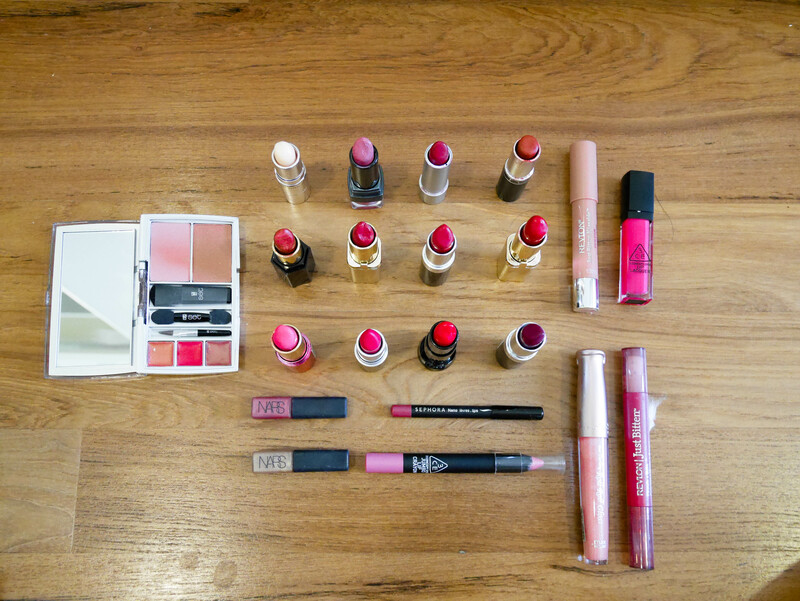 I love lipsticks, particularly red ones and matte ones. My current favourite lip products are the MAC lipstick in All Fired Up and both of my 3CE products which is the super pigmented 3CE lip laquer on the top right and the jumbo lip crayon on the bottom. The 3CE jumbo lip crayon creates the absolute perfect base to layer any product over it! This is a really wonky and bad photo but it illustrates the lipstick colours a lot clearer. This post ended up being a lot longer than I anticipated even though I only went through some of my featured products very quickly. It’s the first time I have typed up a long make up blog post other than on Dayre and it was a lot of fun so hopefully I will be able to do this again.